Birth to three is the most important time in a child’s life. Dr. Montessori said that during this time, we must free the child to go on with his task of self-creation. Our foundation in the Toddler Program is to assist the child in self-creation. Our uniquely prepared toddler environment meets the young child's need for self-creation. This class is designed to assist each child toward independence, social awareness, respect, development of motor skills, and development of language. 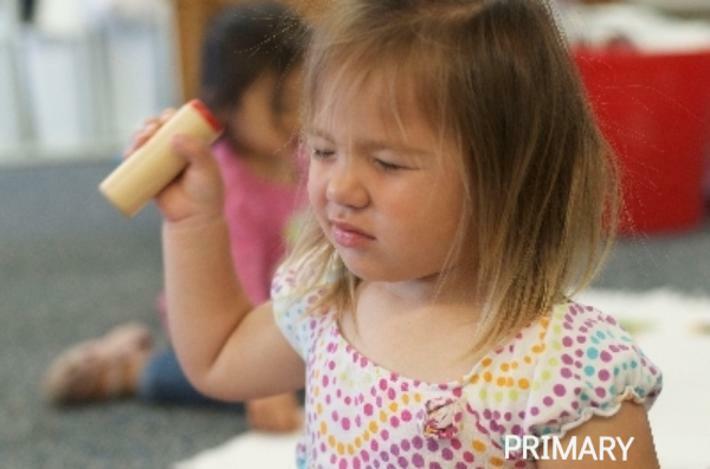 Toddlers have opportunities to meet their physical, social, and emotional needs. The classroom exercises include sensorial work, practical life activities, math, language, music, arts, and cultural subjects. In many instances, this is the first experience the child has of being a member of his own "society." The child is encouraged to be an important functioning member of this society, thus leading him to a feeling of pride and dignity. Waiting one's turn, sharing, and patience are important lessons that each child learns. The Montessori teacher offers the tenderness, warmth and patience so essential at this age. An emphasis on the importance of a peaceful environment, along with the necessary nurturing and caring, are characteristics of this program. The Toddler Program is multi-aged. The younger child observe the older toddlers and are intrinsically motivated to do what they see them doing. The older children are delighted in their new-found skills and help the younger children, which in turn fosters their self esteem. Each classroom has a routine that can be observed as we transition activities throughout the day. Children are potty-trained they when he or she shows signs of readiness. Teachers will positively assist every child to become successful in using the toilet. Nutrition is important with our growing Toddlers. Children are often encouraged to eat their meals independently. If needed, the caring teachers will help each child during meals. The child who completes the Toddler Program will be independent, self confident, and ready to move to the next level.